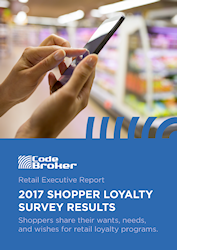 CodeBroker surveyed over one thousand consumers on a wide range of loyalty program topics, from loyalty program usage, to top pain points, to changes consumers would like to see. New research reveals shoppers requirements for today’s loyalty programs. View the research in the 2017 Shopper Loyalty Survey Results by completing the form to download your copy today! The research was conducted by CodeBroker’s market research group from January 9, 2017 through January 23, 2017. The research was conducted online on a range of topics related to retail (non-grocery) loyalty programs. The survey results are based on responses from 1,207 consumers across all age groups, income levels, and geographies throughout the U.S.